Facebook is a site built upon social connections with friends and family and has developed a news experience that also has a strong social component. A majority, 60%, “like” or comment on stories at least sometimes – with 19% that do so often. That is almost on par with clicking on links to the news stories themselves (64%). Just under half, 43%, at least sometimes post or share (10% do so often). 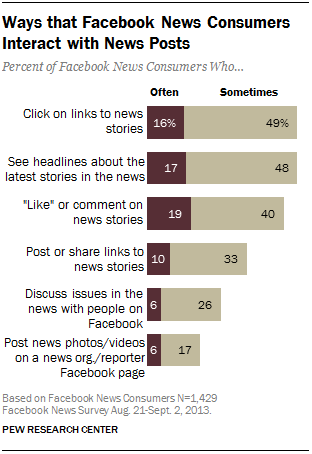 Though, just 23% post directly to a news organization’s or reporter’s Facebook page (6% often). Back and forth discussion about issues in the news occurs at least sometimes for about a third (32%) of Facebook news consumers. Another sign of the social nature is the degree to which friends and family drive the news activity. Just a third, 34%, of Facebook news consumers even include news organizations or individual journalists and commentators directly in their feed by “liking” or following them. That means, then, that two-thirds of people who get news on Facebook have it passed along to them second, third or twentieth hand from their Facebook friends – rather than directly from news organizations. When news organizations or individual reporters are “liked” by Facebook users, they tend to play a strong role in their Facebook news diets. Roughly half of those who do follow news organizations or reporters, 48%, say most of the news they get on Facebook comes from these sources rather than friends and family. These Facebook news consumers who “like” news organizations or journalists also show higher levels of news engagement on this platform. For instance, a majority, 54%, say Facebook is an important way for them to get news; that compares with 38% of Facebook news consumers who do not “like” or follow news organizations. Those who “like” news organizations, reporters or commentators on Facebook are more likely than other news consumers on the platform to see headlines, click on links, comment, post stories and discuss issues in the news. They also are more enamored of the Facebook news experience overall. The vast majority, 84%, enjoy seeing posts about news mixed in with other kinds of posts. That compares with 68% of others who get news on the platform but do not actively “like” news organizations, reporters or commentators. Greater proportions of those who “like” or follow news organizations or individuals regularly see news about entertainment, people and events in their community, national government and politics, crime, local government and politics, health and medicine, local weather and traffic, international news, science and technology, and business. The only type of news that they are not significantly more likely to see regularly on Facebook is news about sports. This group also is more than twice as likely as other Facebook news consumers to turn to the site for breaking news: 44% versus 20%. 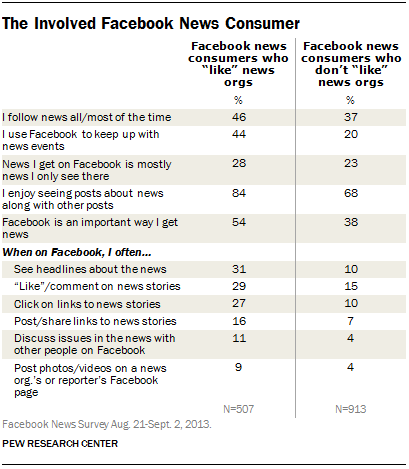 And of that 44%, roughly half say that Facebook is one of the first places they go to find out about a news event.